Etteilla (1738-91) (pseudonym for Jean-Baptiste Alliette), French occultist, who played a central role in the early development of the esoteric Tarot. Through his activities and writings, he was the first to popularize divination by Tarot on a large scale, to publish correspondences between Tarot, astrology, and the Four Elements, and to issue a deck specifically designed for occult purposes. 1770 Publishes Etteilla, ou manière de se récréer avec un jeu de cartes [Etteilla, Or a Way to Entertain Yourself With a Deck of Cards], a book devoted to divination by regular playing cards. 1785 Publishes Manière de se récréer avec le jeu de cartes nomées Tarots [How to Entertain Yourself With the Deck of Cards Called Tarot], the first book devoted to divination by Tarot. Jean-Baptiste Alliette, the son of a food caterer, was born in Paris in 1738. (Only later would he adopt the name Etteilla.) The historic record is silent concerning many aspects of his life. For example, nothing is known about his youth. However, his writing style suggests that he had a modest education at best and may have been, to a significant degree, self-taught; his command of literary French is poor. The historic record shows that he married Jeanne Vattier in 1763, only to separate from her six years later. At this time Alliette earned a living as a seed merchant. Contrary to frequent incorrect reports, no evidence exists to support the notion that he was ever a barber or wig-maker. Illustration (above): Etteilla at work, frontispiece (detail) from Etteillas Cour thèorique et pratique du Livre du Thot (1790) (in Decker, Depaulis, & Dummetts A Wicked Pack of Cards, copyright &COPY; 1996 Decker). By 1770 Alliette was using the name by which he would be best known, Etteilla (his surname spelled backwards). In that year he published his first book, Etteilla, ou manière de se récréer avec un jeu de cartes [Etteilla, Or a Way to Entertain Yourself With a Deck of Cards], which was devoted to explaining the use of regular playing cards for divination. Specifically, he advocated use of the piquet deck to which he added one nontraditional card called Etteilla. The piquet deck, which was a popular shortened pack typically used for gaming, employed the common French suit system (Clubs, Spades, Hearts, and Diamonds). To consult the cards one dealt them into a spread and interpreted each one, applying pre-assigned meanings. Furthermore, each card carried upright and reversed meanings. For example, the Ten of Hearts meant a town and, when reversed, an inheritance. The King of Spades meant a lawyer and, when reversed, a widower. 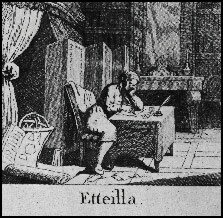 During the final year of his life, 1791, Etteilla even published a cartomantic deck, commonly called the Petit Etteilla, based on this system (see illustration, right). 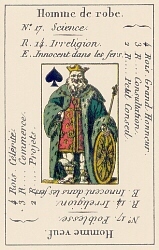 Illustration (above): The King of Spades from the Petit Etteilla (contemporary deck published by France Cartes, based on Etteillas pack of 1791). Click the image for a larger one and an explanation of some of the key words. Etteillas method also applied broad themes to selected groups of cards. For example, court cards from the suit of Hearts implied people with blond or chestnut blond hair, and certain numeric cards from the suit of Spades implied related notions of suffering, e.g., tears, losses, and illness. Whether his system, including its divinatory meanings, was original is unknown. He reported that he had learned card reading from an Italian. He may well have collected, codified, and reported on a pre-existing divinatory system or type of folk wisdom; however, historians are unsure. Nevertheless, the book was a success; it went into a second edition the following year. During this period Etteilla also earned a living as a dealer in antique prints in Paris and, for a short time, Strasbourg. In 1781 the French-speaking Swiss Protestant clergyman and occultist Court de Gébelin, claimed in his massive work Monde primitif [The Primitive World] that Tarot was an Ancient Egyptian book of wisdom, although he offered no convincing evidence and modern historians have long rejected this notion. Later, Etteilla claimed that he had studied Tarot beginning in 1757, long before Court de Gébelins work. Historians have been unable to verify his claim; however, they do know that in 1785 Etteilla published his major contribution to Tarot literature, Manière de se récréer avec le jeu de cartes nomées Tarots [How to Entertain Yourself With the Deck of Cards Called Tarot], which was the first book ever concerning divination by Tarot. Like Gébelin, Etteilla attributed Tarot to the Ancient Egyptians. Going further, he asserted that it was composed by seventeen magi, descendants of Mercury-Thoth, at the Temple of Fire near Memphis exactly 1,828 years after the Creation or 171 years after the Flood, which would have made Tarot exactly 2,125 years old when Etteilla published his book. He wrote all this and much more about the history of the cards without providing one scrap of supporting evidence. Still, for the first time he provided published divinatory meanings for each card (both upright and reversed orientations) and methods for conducting readings, including a relatively complex one which reflected his unique synthesis of Tarot and astrology. Copyright &COPY; 2001 James W. Revak. All rights reserved. Version 1.1 (11/23/01).